Dr. Harris, Superintendent of Floyd County Public Schools, tries a dish prepared by the high school culinary art students. In 2013 Plenty!’s VISTA volunteer Alexis Bressler, piloted an “Eco Top Chef” Project at Floyd County High School to motivate students to learn more about local food systems. Guest speakers presented on local farms, businesses and food pantries and students tried an exercise to see how far grocery store tomatoes travel. School Nutritionist, Pam Harris, spoke about the financial and nutritional guidelines for school lunches. 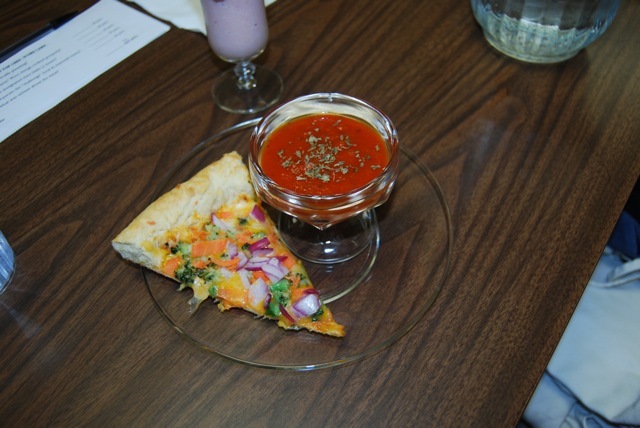 The Culinary Arts students then competed to create a lunch that conformed to school guidelines while being tasty, nutritious and using some local ingredients. With high school staffers and community volunteers serving as judges, students presented a wonderful array of dishes from carrot cake to kale soup. Teacher Laura Cantrell was so impresed with the program that she expects to present it again soon. We will see what the budding chefs can create next time!